Hey Guys and Gals my names Aaron Vage and I’m a 16 year old shredder. I know every guitarists’ dream is to create the most mind blowing guitar solo ever! – For you guys who have just started to look into the vast world of shred guitar it may look like a daunting task to even create a pentatonic based blues solo at 60bpm! but I can tell you that if you are willing to dedicate every spare minute of your time to practising and playing your guitar (with the guidance of these licks and solos I am about to show you), you will notice a dramatic change in your playing within a short space of time! The key to great shred guitar solo is to set an overall theme, for example a solo that tells a individual story if you like. A great story is always going somewhere it never becomes static or boring, if you use this principle in the construction of a guitar solo you will find that it will help a lot. To do this you have to listen to your inner ear. 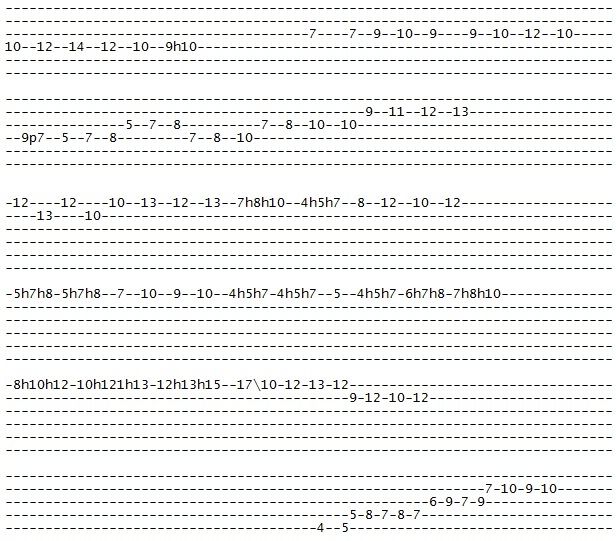 Can you visualise the guitar fret board and think about were the lead melody will be played and how it will sound? Then think about what scales or modes will agree with the chord progression or guitar riff you are soloing over. If you can allow yourself to do this you are on the right track. 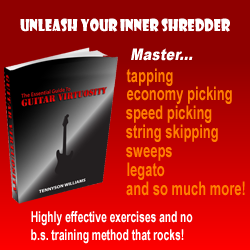 In a great shred guitar solo a pinched harmonic or high note may jump out surprisingly then the melody may sink down, nearly as if it was apologising or to act as a counter balance, as the notes climb higher the melody strives to be resolved from one position to another climbing higher and approaching the climax on the highest note! Then the melody may fall like an after thought back to the beginning tying the solo up into a neat package!! If you think of a guitar solo in this way you will un-lock the door to individuality therefore creating your own unique style. Practice this solo and build it up to a speed of 160 bpm. I guarantee that if you learn this solo or take the key extracts and work on them that you will notice dramatic change in your playing, and if you keep setting a theme for each of your guitar solos your “inner ear” will improve therefore you will be able to play what you here in your head!